The other day I was at Zeller's and I saw some Coca-Cola and Coors Light galvanized metal tubs, wooden crates and awesome vintage-y glassware. The kind of thing that would be so amazingly cool at a backyard barbeque! So in typical "me" fashion, I decided to check out some websites and see what the internet has to offer me. The ones above are from Pottery Barn, but they are now sold out. Although, they found them from many different sources, so plenty of similar ones are definitely out there. These crates would be great if you flipped them over and maybe laid your desserts out on them [especially awesome if your desserts are fruit cups or cupcakes or tarts or something individual]. 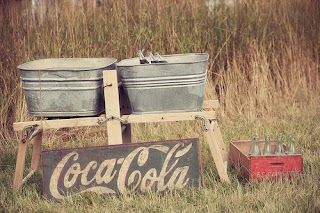 Here is a cute metal tub from AllCola.com. Kill two birds with one stone: it's not only a décor piece, but fill it with ice and keep your pop bottles cold. How practical and adorable! 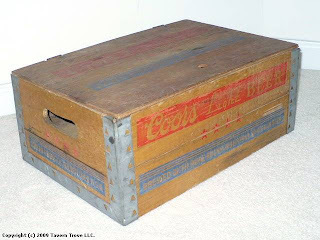 Is it just me or is this 1939 Coors Light Beer case absolutely fabulous? I think it would look perfectly sweet perched on your buffet table with some plates and cutlery on it for your guests to grab. 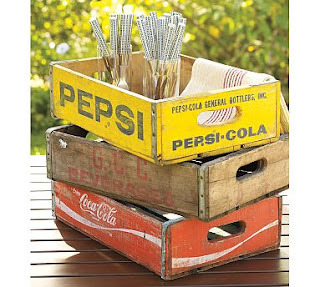 Try putting an old beer or pop bottle with a single stem flower in it on top of or beside the crate. Etsy has a bunch of amazing finds, as usual, using their "vintage" search feature. Being Canadian, I was kind of partial to the one above though. This would make a wonderful centrepiece filled with flowers! Or you could wrap up everyone's cutlery in a napkin or put it in their glass and put each one in a slot for them to take. You are probably familiar with my WeddingBee obsession, and I remember a few months back seeing Mrs. Cherry Pie posting about her country-chic wedding which included some fantastic vintage tubs and crates and her penchant for Mexican Coke. 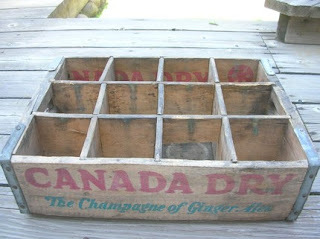 Above is a picture of what she did at her wedding with the tubs and crates. How cute! If I can create some reason for a party, I will most likely be picking up some version of these crates and tubs. Have you ever used either for an event?